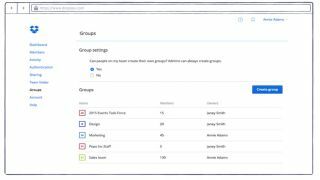 Dropbox for Business has finally been endowed with Groups functionality and a Groups API to make it easier to collaborate across teams within an organization. The duo of new features, which have been available as part of an early access program since November, mean that admins can get a better handle on workers and give only certain members of the team access to certain features. Groups as a feature being added allows list of members to be created and then managed in order to easily give access to certain folders, and team admins can also keep groups synced with Active Directory (AD) data. The API for groups, meanwhile, will enable Dropbox customers to integrate groups with their existing IT systems and will also allow IT admins to integrate directly with their AD and LDAP solutions thus allowing groups to stay in sync with AD and LDAP user data. 12,000 companies signed up for the aforementioned early access program and Waseem Daher, Dropbox product manager focused on collaboration, stated that the feature has been requested often by its enterprise clients. Dropbox for Business customers won't have to pay anything extra for Groups and it is available immediately. Is Dropbox for Business the right cloud storage tool for your organisation?